After playing 14 seasons for the Jets and notching 817 points, the second-highest total in franchise history, Thomas Steen was already considered the unofficial mayor of Winnipeg. More than a decade after returning to the city following three years playing in Germany, Steen now works in close quarters with the actual mayor of Winnipeg. That's because the longtime fan favorite has found a new career working as, of all things, a Winnipeg city councilman. "I loved playing here and it has just continued with the politics," Steen told NHL.com. "Knock on wood." The road from hockey star to local politician has been a natural one for Steen, who won his city council seat in the Elmwood-East Kildonan district in 2010. It's not a career he would have contemplated when he arrived in Winnipeg in 1981. Fortunately for him, countrymen Ulf Nilsson and Anders Hedberg starred for the Jets in the World Hockey Association, establishing the city's love affair with Swedish players. That precedent helped Steen, who didn't always see a future in Winnipeg. "When I initially came here, I thought I would just play the contract. I didn't even think about the future," Steen said. "After two years, I really loved it. Playing hockey and being young living in Canada was just great. When we had kids, it got better. It's a great place to raise a family." After starring with the Jets, Steen retired from the NHL and established business interests in his new home rather than move with the team to Phoenix. He even had a hand in moving the Manitoba Moose to Winnipeg from Minnesota, serving as the team's director of player development. While playing in Germany, Steen's intentions were always to return to Winnipeg, where he remained active as a businessman and philanthropist. It was only a matter of time before someone suggested he enter the political arena. "It actually started with doing charity work for the Winnipeg Jets. That got me into meeting all these politicians. One day they asked me to run," Steen said. "It was so out of my normal world. It was a new experience and they thought I was fit for it." While Steen was unsure of his own qualifications for the job, his former teammates always respected him as a leader and competitor. They may not have seen it at the time, but those skills would prove helpful in his future as a statesman. "[He was] quiet as a church mouse, even at the end of his career. He wouldn't say too much. 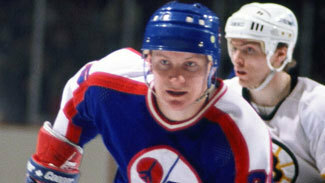 He just wanted to play the game, hated losing," said Doug Smail, a longtime linemate of Steen's with the Jets. "He was just a very quiet type who led by example. He was highly skilled and humble enough to take a second seat to Dale Hawerchuk. He was content to do that because he understood the value of team." Revered as he was in Winnipeg, the new gig took some getting used to for Steen. But in two years, he's learned a lot about navigating Winnipeg city hall. And while he doesn't think of himself as a traditional politician, he's come to love his new career. "It's taken time to get used to it, but I really enjoy it. I meet tons of people and the job itself has been better than I could imagine. The people have been great. I really like it," Steen said. "There are a lot of similarities to hockey. The residents are my information. What they want done, that's the job I try to do." The skills Steen demonstrated on the ice as a player have since become assets as a city councilman. With Winnipeg still celebrating last season's return of the Jets, it's made for a unique transition he hopes will only further bond him to the city. "There's so much going on. There is a lot of criticism and stuff going in every direction. It's pretty intense," said Steen, whose number was retired by the Coyotes in 2006. "[Hockey experience] helps. It's dealing with the media and all that. It's just lower pay."